Air duct cleaning can provide a number of benefits to your Clemmons, NC home, including cleaner air and a more efficient system that uses less energy. The air ducts in your home play an important role in providing good air flow and clean air for your family to breathe. 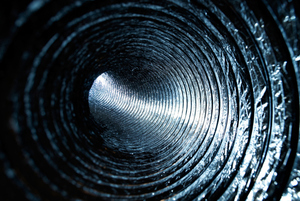 Many people don’t think about air duct cleaning very often, but it is a crucial aspect of home maintenance. In the average home with six rooms, everyday living produces up to 40 pounds of dust per year. The air ducts will pull air in and push it out into the rooms, keeping most of the dirt and dust behind. When the ducts are overloaded with dirt, the system becomes much less efficient, and your family will be breathing in dirtier air. This can lead to allergic reactions and breathing problems in family members of all ages. If you notice that the ducts are looking a little dirty in your home, that is only the surface of the problem. When dirt and dust are visible from the vents, it means that the ducts inside are actually much more overloaded. Air duct cleaning can provide a number of benefits to your home, including cleaner air and a more efficient system that uses less energy. The U.S. Department of Energy reports that up to 40% of energy used for residential cooling and heating is wasted, but that doesn’t have to be the case for your home if you are diligent with air duct cleaning. In addition to air duct cleaning, you should change the filters regularly, so they can work to keep dirt and dust out of the system. At AdvantaClean of Iredell County, we offer air duct cleaning services to properties that are in and around Clemmons, North Carolina. Contact us today to schedule an appointment.